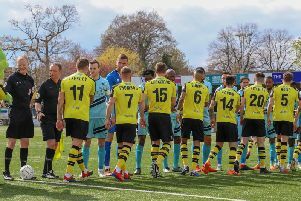 Having produced a man of the match performance to help Harrogate Town to a goalless draw with Wrexham in midweek, James Belshaw is targeting maximum points from Saturday’s trip to Boreham Wood. The 27-year-old stopper pulled off a trio of fine saves on Tuesday evening as the Wetherby Road outfit bounced back from their first defeat of the campaign, a 3-0 reverse at the hands of Leyton Orient. “We needed a good reaction to the Orient result and we definitely got that against Wrexham,” Belshaw said. “We’ve had an unbelievable start, but we want to carry it on, so a victory this weekend is key if we are to keep the pressure on the rest of the teams up at the top of the table. Town have dropped down two places to third in the National League standings ahead of Saturday’s trip to Hertfordshire. Play-off finalists last term, the Wood currently sit 11th, having won five of their opening 13 fixtures, and are unbeaten in seven on home turf. All you need to know about Boreham Wood. Last season: 4th (out of 24) in the National League with 20 wins from 46 games. Beaten 2-1 by ten-man Tranmere in promotion play-off final. Last time out: The Wood conceded late on as they went down 1-0 at Eastleigh on Tuesday evening. In the dug-out: Luke Garrard, 33, was appointed manager in October 2015, which, at the time, made him the youngest boss in all of England's top five divisions. He has overseen five wins, four draws and four defeats so far this season. Looking ahead to the visit of Town, Garrard told BWTV: "Harrogate will be tough. I've watched them at length, they've got good personnel in forward areas and wide areas. "They've got a collective and group mentality - a winning habit - throughout the whole club. "They've taken to the National League superbly and scored a hell of a lot of goals so that's something we need to guard against, but we've been good at home." One to watch: Ex-Charlton Athletic striker Josh Umerah is the Wood's leading marksman with five goals to his name already. For live updates and post-match reaction from Saturday's clash (3pm kick-off) follow @HarrogateSport on Twitter.